Preheat oven to 350 F. Cut about 1/2 inch off the top of the loaf with a serrated knife. Remove bread on the inside, making it hollow. Leave about 1 1/2 inches thick on the inside. Using your basting brush, brush olive oil on the inside of the bread bowl. This creates a seal, ensuring whatever you put in the bread bowl will not leak out. Bake bread bowl on a baking sheet for 15 minutes, until golden on the inside. Remove from oven, fill with desired soup or stew and serve! For personal servings of dips and sauces like hummus, make bread bowls out of small dinner rolls. 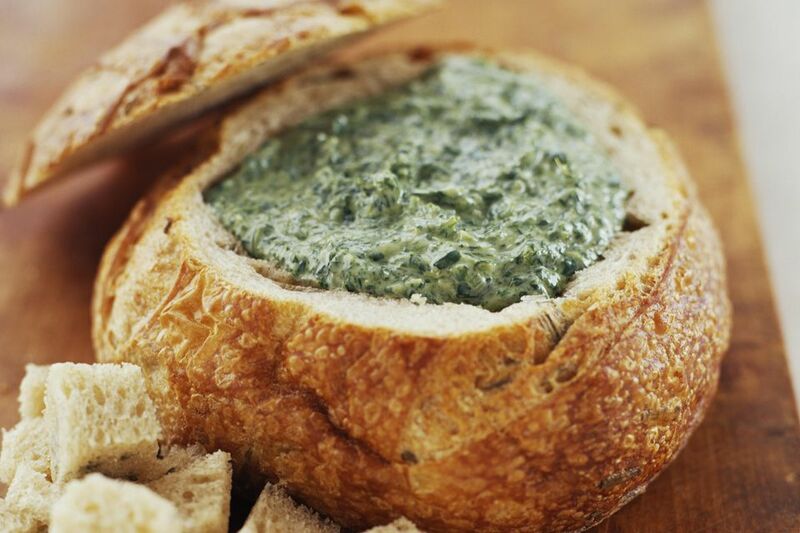 You can also save the top, brush olive oil underneath, bake with the bowl, and serve the bread bowl with a "lid"! A bread bowl is also a fun way to serve a salad, especially fatoush.